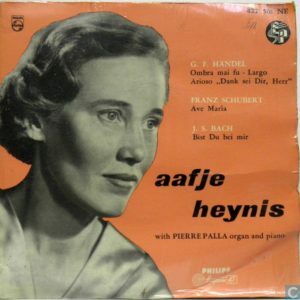 We have media reports of the death today of Aafje Heynis, a contralto whose voice and repertoire closely resembled the great English singer, Kathleen Ferrier. Aafje, who was 91, was closely attuned to the music of Gustav Mahler, as well as Bach, Handel, Mendelssohn and Brahms. She made numerous recordings, mostly for Philips. A great singer has passed away. “The velvet contralto” (De fluwelen alt), as she was called in the Netherlands, always refused any comparison with Mrs. Ferrier. She never sought fame and remained a humble, even shy, most kind and deeply religious lady that sang so beautifully and emotionally intense. I cherish her recordings. May she rest in peace. What an insulting way to take note of this death . The headline says “Kathleen Ferrier has died,” which is true, but she died in 1953. Shouldn’t it refer to the death of Aafje Heynis instead?